TORONTO, ONTARIO–(Marketwired – April 29, 2015) –Continental Gold Limited (TSX:CNL)(OTCQX:CGOOF) (“Continental” or the “Company”) is pleased to announce results for 17 diamond drill-holes through the Yaraguá vein system at the Company’s 100%-owned Buriticá project in Antioquia, Colombia. Drilling continues with the goal of upgrading Inferred resources into the Measured and Indicated categories under National Instrument 43-101 (“NI 43-101”) guidelines, and delivering overall mineral resource growth. 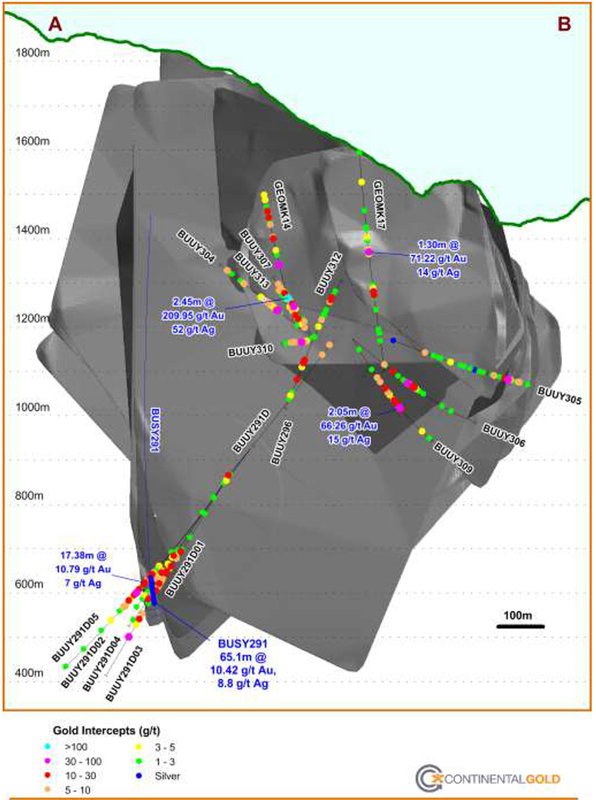 An updated mineral resource estimate for the Buriticá project remains on track for completion in late Q2 2015. – Step-out drilling was successful in extending the Yaraguá system to the west and to depth whereas infill drilling, largely at high angles to the veins, focused on elevations around the Higabra tunnel. 21.15 metres @ 4.6 g/t gold and 4 g/t silver (BUUY291D05, elevation of 595 metres). These drill-holes, along with BUSY291, are interpreted to outline a northeast-elongate zone, more than 100 metres in vertical extent and 25 x 40 metres in horizontal strike, open vertically in both directions and along strike to the southwest. Mineralization takes the form of moderately-dipping, sheeted gold-rich pyrite-Kspar veinlets, locally cross-cut by auriferous base-metal veins. This style of mineralization (“291-Style”) is interpreted as relatively high-temperature “porphyry” style and may contribute further to more bulk style gold potential of Buriticá at depth. 2.6 metres @ 8.1 g/t gold and 6 g/t silver (BUUY309, elevation of 1,085 metres). Most of the Yaraguá vein families remain open to depth and the grades encountered in this drilling are encouraging for future mineral resource growth. 2.45 metres @ 14.2 g/t gold and 15 g/t silver (BUUY291D04, SOF, elevation of 693 metres). – These and other intercepts will contribute to increased confidence levels of high-grade gold and silver mineral resources within master vein families covering large vertical and horizontal extents of the Yaraguá system. The grade X thicknesses of these veins in the 1,000-1,400-metre range of elevations are particularly encouraging as this is proximal to the main haulage developments proposed in the 2014 Preliminary Economic Assessment (the “PEA”), and also restricts the influence of areas within the Yaraguá system that were previously modelled as containing predominately low to medium precious metal grades. 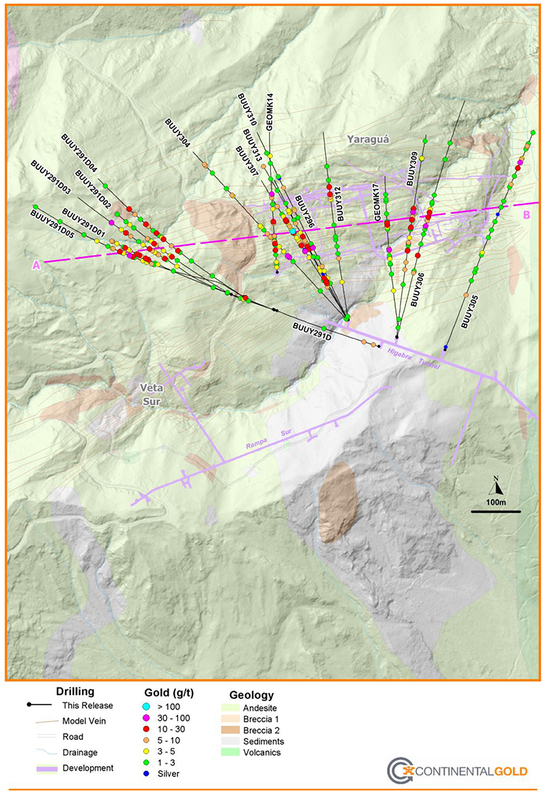 Continental’s 100%-owned, 59,285-hectare project, Buriticá, contains several known areas of high-grade gold and silver mineralization, of base metal carbonate-style (“Stage I”) variably overprinted by texturally and chemically distinctive high-grade (“Stage II”) mineralization. The two most extensively explored of these areas (the Yaraguá and Veta Sur systems) are central to this land package. The Yaraguá system has been drill-outlined along 1,100 metres of strike and 1,700 vertical metres and partially sampled in underground developments. The Veta Sur system has been drill-outlined along 1,000+ metres of strike and 1,800 vertical metres and has been partially sampled in underground developments. Both systems are characterized by multiple, steeply-dipping veins and broader, more disseminated mineralization and both remain open at depth and along strike, at high grades. See “About Continental Gold” below for a précis of the PEA prepared in accordance with NI 43-101. This release documents the results of infill and extension drilling through the Yaraguá vein system. Significant new drill intercepts are listed below in Table I and are referenced in Figures 1, 2, 3 and 4. * Intercepts calculated at 1 g/t gold + 50 g/t silver cut-off grades for minimum intervals of 0.5 metres, with up to 30% internal dilution. True widths not accurately known but generally are between 70% of the down-hole interval and near true width(for GEOMK14, GEOMK17 and BUUY291D-D05, about 50%). Drill-holes designated “BUUY” were collared from underground, and drill-holes designated “BUSY” were collared at surface. Holes directionally-drilled from “mother holes” (BUUYDxxx or BUSYDxxx) are designated BUUYxxxDxx or BUSYxxxDxx), as the case may be. ** Intercepts in vein domains are respectively nominated by vein code (e.g. VNC) whereas other intercepts are designated as below or outside of the current Buriticá mineral resource envelopes. Dilution is defined as new mineralization outside of modelled vein domains. Intercepts with grades X thicknesses apparently substantially greater than for the corresponding vein domains in the current mineral resource block model are also highlighted in bold. Infill and extension drilling of Yaraguá comprised four fans (for 15 underground drill-holes) drilled from chambers set up in the Higabra Valley tunnel, at elevations around 1,170 metres (Figures 1 and 2). Drill-holes in three of the fans were broadly north-directed and shallowly-inclined to achieve very high angle intersections with master vein sets through most of the Yaraguá vein families. Two holes (GEOMK14 and GEOMK17) were drilled from surface, primarily for geotechnical purposes, but also infilled parts of the Yaraguá system at higher elevations than the underground holes were targeting. Five holes (BUUY291D01-D05) were directionally drilled off of BUUY291D, deep into western Yaraguá. These drill-holes, along with BUSY291, are interpreted to outline a northeast-elongate zone, over 100 metres in vertical extent and 25 x 40 metres in the horizontal, open to depth, upwards and to the southwest. Mineralization takes the form of moderately-dipping, sheeted gold-rich pyrite-Kspar veinlets with high lead/zinc but base-metal-poor, chemically and morphologically distinct from and locally cross-cut by auriferous base-metal veins. Selvages around the pyritic veinlets exhibit potassic, biotite-stable alteration. This mineralization (“291-Style”) is interpreted as an apparently relatively high-temperature, “porphyry” style and may contribute further to more bulk style gold potential of Buriticá at depth. 2.45 metres @ 14.3 g/t gold and 15 g/t silver (BUUY291D04, SOF, elevation of 693 metres). These and other intercepts will contribute to increased confidence levels of high-grade gold and silver mineral resources within master vein families through large vertical and horizontal extents of the Yaraguá system. The grade X thicknesses of these veins in the 1,000-1,400-metre range of elevations are particularly encouraging as this is proximal to the main haulage developments proposed in the PEA and also restricts the influence of areas within Yaraguá that were previously modelled as containing predominately low to medium precious metal grades. Figure 1 – Plan view of highlights of new drilling in the Yaraguá system, showing the surface projection of veins in the current (2014) Yaraguá mineral resource model on geology-topography and underground developments. Line A-B refers to the long section line for Figure 4, lines C-D and E-F, respectively, to cross sections, Figures 2 and 3. 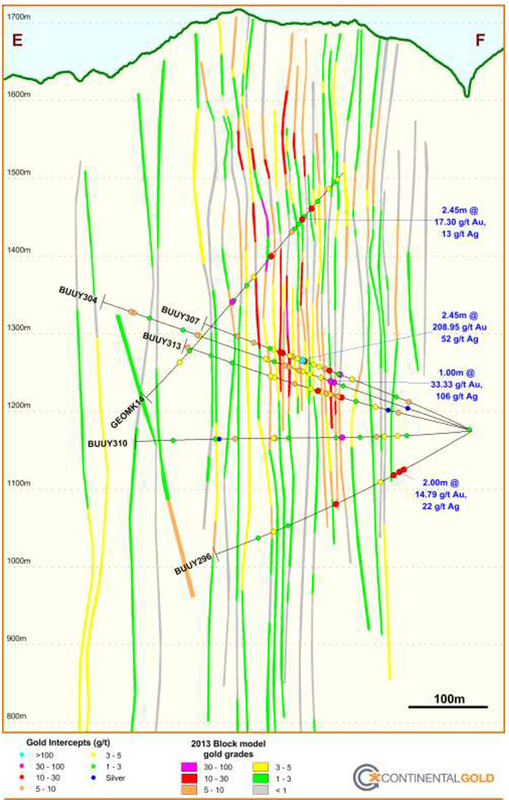 Figure 2 – Cross section (line C-D on Figure 1) showing highlights of new drilling in western Yaraguá against the grades of veins from the 2014 Yaraguá mineral resource block model. 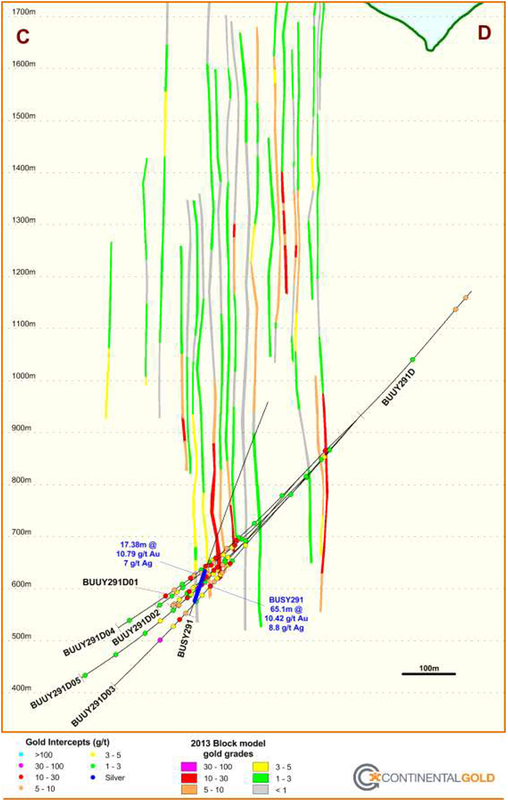 Figure 3 – Cross section (line E-F on Figure 1) showing highlights of new drilling in central Yaraguá against the grades of veins from the 2014 Yaraguá mineral resource block model. Figure 4 – Long Section (line A-B on Figure 1) showing highlights of new drilling against the outlines of the 2014 Yaraguá mineral resource envelope.